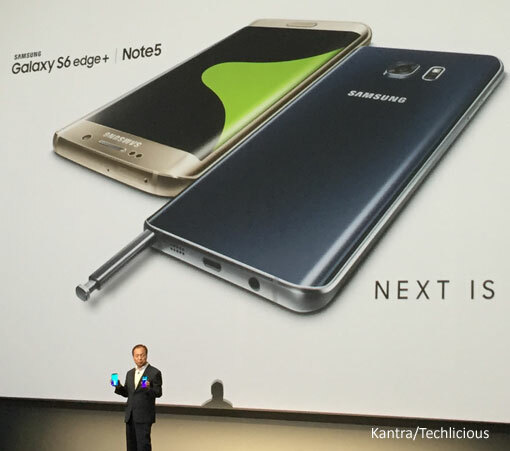 Proclaiming "Next is Now," Samsung unveiled its new consumer- and business-oriented flagship phones, the curved-edged Galaxy S6 Edge Plus and the Galaxy Note 5, at an event this morning at Lincoln Center's Alice Tully Hall in New York City. Both new flagships boast 5.7-inch Quad HD (2560 x 1440 pixel) AMOLED screens, yet are a hair thinner than their predecessors; the S6 Edge Plus measures 6.9mm thin vs. the plain S6 Edge with its smaller 5.1-inch display at 7 mm thick, while the Note 5, which maintains the same sized screen, at 7.6mm is .8mm thinner than the Note 4. 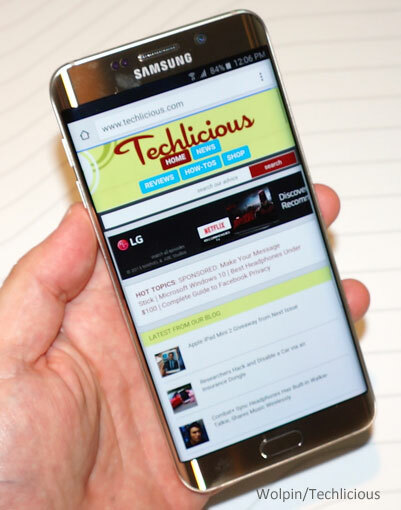 More surprisingly, at 171 grams, the Note 5 is actually 5 grams lighter than the Note 4. The new Edge Plus feels trimmer but sleek, with Gorilla Glass 4 protected both front and rear, which means you'll be constantly buffing both sides. Samsung has also improved the functionality of both phones. For multitaskers, there's a new and improved SideSync 4.0, which lets you share content, messaging and even phone calls between Samsung smartphones and laptops – including Apple Macs. The Edge now lets you slide right from the left curbed edge to see a vertical row of contacts and frequently accessed apps. The Note 5 has a larger and stiffer S Pen that Samsung claims is more concise and sensitive, "like writing with a ball point pen," according to the company. Even more conveniently, you can now write on the screen even when it's off, handy for jotting down a quick phone number or, appropriately, a note [see the video below]. Samsung's has made its S Pen-accessible Air Command feature to access stylus apps and functions more intuitive and accessible from any screen as long as the S Pen is out of its holster. With the S Pen you'll also be able to capture a screen with a long list, even if that list is off the screen, such as long navigation directions. Both new phones carry over similar specs from their predecessors – a 2560 x 1440 pixel AMOLED screen, 2160p 4K video recording and 16/5 MP rear and front cameras. Both phones also now combine the company's video digital image stabilization (VDIS) with optical image stabilization (OIS) to reduce hand jitter and improve low light focusing. Also added to the camera is Live Streaming, which enables you to live stream via YouTube rather than a specific social media app. Both new phones also run on Samsung's octa-core (actually dual 1.5GHz and 2.1 GHz quad cores) Exynos 7420 engine, the same as in the first Edge but a slight upgrade in processing from an earlier Exynos octa-core chip. Samsung has boosted both phones from 3GB to 4GB of RAM to improve multitasking and overall app booting speed. There is no 128GB version of the Edge Plus, however, as there was with the original. To support the bigger screen, Samsung has enlarged the Edge Plus battery from 2450 mAh to 3000 mAh, and is equipped with Samsung's Fast Charging system – its version of Qualcomm's Quick Charge 2.0 technology – that can fully recharge the phone in 90 minutes, twice as fast as without the supplied charger. But Samsung also is the first smartphone maker to include the new Qi wireless fast charging, which can cordlessly fully recharge the Edge Plus in two hours. The two new phones will go on pre-sale today at 3pm and will be available on August 21; while Samsung didn't announce pricing, AT&T and Sprint have (so far): at AT&T, the 32GB version of the S6 Edge Plus will be $299.99 subsidized and $814.99 "no commit" and the 64GB edition will run you $399.99/$914.99, and the Galaxy Note 5 will run $249.99/$739.99 for the 32GB, $349.99/$839.99 for the 64GB; at Sprint, you'll pay $349.99 subsidized and $792 full for the 32GB S6 Edge Plus and $449.99/$888 for the 64GB, $249/$720 for the 32GB Note 5 and $349.99/$816 for the 64GB, or leased or bought via the Sprint Easy Pay installment plan. In anticipation of the new phones, a week ago, T-Mobile became the first carrier to drop the prices on the company's previous consumer flagships, the Galaxy S6 and S6 Edge, unveiled earlier this year. Other carriers are likely to follow T-Mobile's lead. The Korean giant also unveiled Samsung Pay, its nearly universal compatible mobile pay system that can be used both with new NFC-enabled point-of-sale terminals as well as most existing magnetic strip card readers. 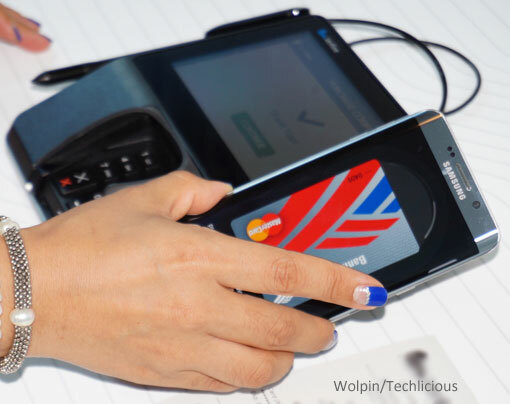 Understanding that few retailers support the NFC terminals necessary for Apple Pay and other mobile payment schemes, Samsung Pay uses both NFC and MST – the technology used to read magnetic cards on credit, debit, loyalty, store and gift cards. In a nod to Apple Pay's igniting the mobile pay market, Samsung noted "it's not about being first in the market but creating compelling technology" to solve the lack of retail NFC problem. Samsung claims its solution, available on all Galaxy S6 variations as well as the new Note 5, will works with almost all magnetic card readers as well as NFC. A user has to call up the card on its screen and verify using the phone's fingerprint reader, then hold the phone to where you'd slide a card. Security is supplied by Samsung's malware-shield Knox software as well as similar tokenization used by Apple Pay – no credit card numbers or personal data is transmitted during the transaction. Samsung Pay will be supported by American Express, MasterCard, Visa, CitiBank, Bank of America, Chase, and around a dozen other financial institutions; store-branded cards, membership and gift cards also are supported. Samsung Pay will launch in Korea on August 20 and in the U.S. on September 3.